It’s a new day, a new season. I welcome Pentecost for lots of reasons this year! This morning at 6:28 a.m. a new granddaughter was born. 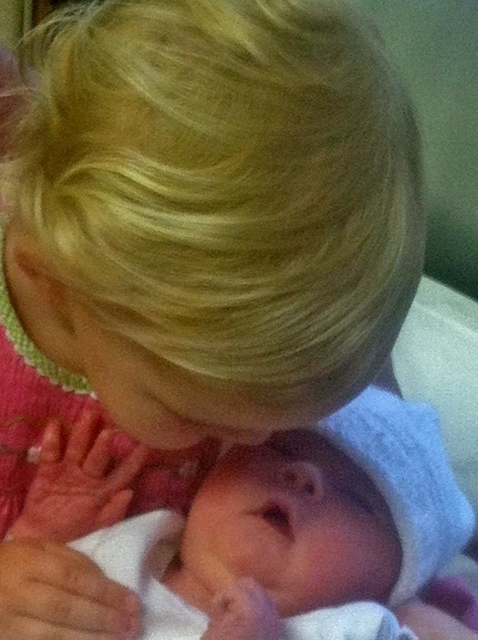 Joella Anne McClendon was born to Josh and Karen and beautifully welcomed by her big sister Kaela. Joella is an interesting name, and it fits both Pentecost and my family. Her birth will always be connected to the Spirit’s power predicted by the prophet Joel (Joel 2:28-32) and fulfilled on the first Pentecost. As for the name’s connection to us, I can name at least 17 family members who have been named Joel. Joel/Joella is a great name that literally means, “The Lord is God!” Josh’s Hebrew classes have come in handy as he and Karen have selected names. Whenever there is an “el” in a name you can bank on God showing up because it is a shortened rendition of Elohim (God). Way to go in sharing the faith-reminders of Kaela (“Who is Like God?”) and Joella (“The Lord is God!”). So during Pentecost we celebrate the power of God’s Spirit poured out on Jesus’ followers. Pentecost has appropriately been called the birthday of the church, and it will certainly be remembered by us as Joella’s birthday. Pentecost is very personal this year because of Narcie and the baby. Why? The answer is the same as it must have been for Jesus’ followers on that first Pentecost. The outpouring of the Holy Spirit on Pentecost turned reluctant fear-ridden disciples into daring witnesses for Jesus. After Pentecost every apostle but John gladly died martyr’s deaths for the sake of Christ. The Greek word martyrios meant witness before it came to mean someone willing to die for their beliefs. Pentecost gave Jesus’ followers supernatural power that inspired them to do amazing things. Pentecost is such a contrast to our usual experience of God. Perhaps we should let God shake us up more so that we won’t be so freaked out by life’s tidal waves. How would we react if our church buildings were shaken like what occurred on Pentecost? What would our reaction be if we saw flickering flames dancing above people’s heads while they spoke about Jesus in unknown languages? Would we be worried? I hope not, but most of our churches are afraid of a smidgeon of the Holy Spirit, much less a real dose. Pentecost is a reminder of what God can do in and through us, not what God can do for us! A God chained to our desires will always be too weak to deliver us from evil or whatever trouble comes our way. So from one extreme to another we go, God-in-a-box to God-unleashed. Which would you rather experience? I heard of one woman whose idea of worship was decidedly focused on meeting her own personal needs. She complained to the organist one Sunday, “Your preludes are so loud, I can’t hear what my friends are saying.” True Spirit-filled worship is more in tune with what pleases God than us. After all, transformative worship correctly identifies God as the audience for everything we do in worship. The congregants are the actors, and those who serve behind the chancel rail are stage hands of sorts who direct the congregation/actors in whether or not to bow their heads, give offerings, stand up, or sit down, etc. Worship services put God first and foremost or they aren’t worship, and they aren’t relevant to people who have been on life’s trapeze without a net! Pentecost should remind us that God can do mighty things that are out of the norm to those who truly worship. A woman was attending a meeting of Church Women United where the secretary asked what her church affiliation was. She replied, “I’m United Methodist, but my husband is nondimensional.” Surely she meant nondenominational, but being nondimensional in our faith seems to be pretty popular – shallow, predictable, with a one-sided “What’s in it for me?” attitude. Many want a domesticated God that isn’t Pentecostal. We are afraid of a multi-dimensional God because a wild God who shakes buildings might shake us up, too. Let me tell you, from what we’ve been through lately, and more truthfully our whole life, we don’t want a flat one dimensional or non-dimensional God ever! We want and need the real deal – a God of Power and Might! Come, Holy Spirit, Come! Who is like God? Nobody! The Lord is God! Amen!